Greetings. As any d20 enthusiast can tell you, prestige classes are one of the most popular—and prolific—aspects of the game. Just the number of prestige classes produced by Wizards of the Coast alone is tremendous. Yet, with a veritable flood of prestige classes it can often be hard to determine how general prestige classes can be made to fit into your rather specific campaign—after all, not every class is as universal as the archmage. Be it a homebrew world, or the Dragonlance setting, certain prestige classes are difficult to work into the world scheme—be it that there isn’t a particular demand for the class’s niche, or that the very concept behind the class goes against established elements of the setting. Change the Background. If the inherent background presented with a prestige class doesn’t fit your campaign perfectly as-is, then feel free to change them. When you do so, it’s generally advisable to keep the class’s theme as close to the original idea as possible or seriously reconsider whether or not the class has a place within your campaign at all. Don’t Overdo It. In order to lend validity to one of the aforementioned “difficult” prestige classes existing in your campaign, characters who possess levels in each class should be fairly rare, even completely unique on occasion. If it was a bit of a stretch to include the class in the first place, it’s an exercise in elasticity to justify hundreds of characters with the class. On Krynn, the alienist is an individual who has managed to tap into the power of the Beyond—the realm of Chaos, and the primal matter that all order and creation was birthed from. He is driven to unlock the true secrets of the universe by seeking them in their unadulterated and “pure” form by peeling back the layers of reality and dabbling in the domicile of the Father of All-and-Nothing. Exposure to the nonsensical randomness within allows the spellcaster to draw off of the Beyond and augment his magic with it, as he pulls clumps of the protoplasmic chaos and shaping it into pseudonatural creatures that he summons. Eventually the Beyond taints the magical bond between the mage and his familiar, turning the creature into a pseudonatural thing. Class Requirements: The class’s requirements mostly remain unchanged, however should a character come into contact with a creature of chaos such as the magori, daemon warriors, fire dragons, or frost and shadow wights, it counts for the special requirement of meeting a pseudonatural creature. Time Period: Ideally the alienist works best in a campaign set after the War of Souls. At this point mortals have a fair amount of knowledge about Chaos and the Beyond, in addition to the ability to access the rest of Krynn’s cosmology. The alienist can be used in other eras, but with some work. During the early Fifth Age Takhisis could have given a specific sorcerer (or more than one) access to Krynn’s cosmological areas knowing full well the detrimental effects that would befall the unwary alienist. In earlier eras a character’s exposure to the insanity that is Chaos could have come in the form of contact with the Greygem. Alienists in Adventures: The most obvious use of the alienist is to make it a crazed wizard or sorcerer intent upon wiping out all of existence in order to restore to it the “truth” and disorder of the Beyond. Perhaps after a run-in with said alienist one of the PC’s decides that she wants to devote her time to studying Chaos and the Beyond in order to prevent further catastrophe. Yet she quickly finds herself in over her head, and quickly heading towards becoming the threat she sought to avert. In small concentrated areas of Ansalon—particularly Mithas and Kothas—are bands of fearsome and devoted warriors belonging to a group called the Fist of Sargonnas (or Sargas among the minotaurs). The Fist of Sargonnas is an elite group of warriors employed by the church of the aforementioned god, acting as enforcers whenever needed. The life of a Fist is brutal and callous and is often based on travel—whether around the Mithas and Kothas to silence dissenting worshipers of Kiri-Jolith, or being assigned to Silvanesti to help with the invasion plans. Class Requirements: Quite obviously a hopeful Fist must worship Sargonnas since Hextor doesn’t exist in the Dragonlance setting. Otherwise the requirements for this class remain the same. Time Periods: The fist of Sargonnas is a viable class any time the gods are known throughout Ansalon. This even includes the early Age of Mortals, as none of the class’s features require divine sponsorship. Indeed, a Fist of Sargonnas in this time will be faced with the apparent death of his god, creating a wealth of roleplaying opportunities. 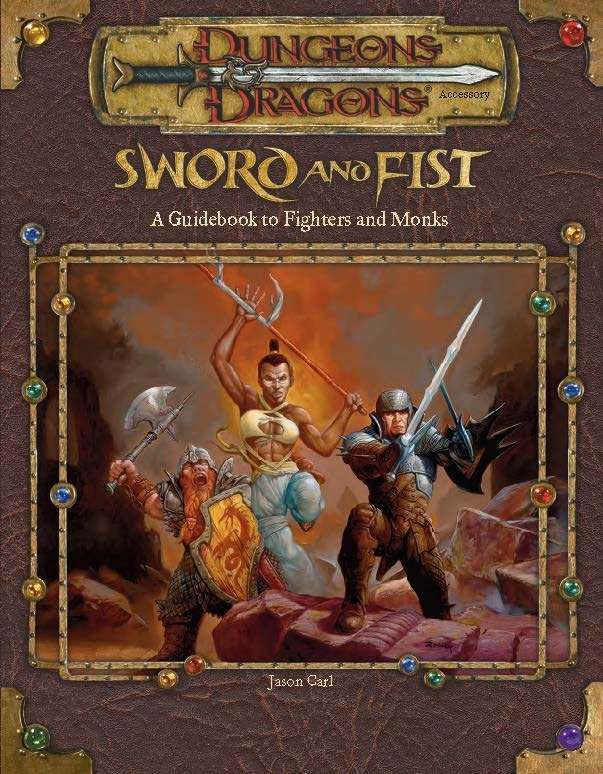 Fists in Adventures: A Fist of Sargonnas may be encountered anywhere—be he a respected warrior in the heart of Neraka, or a member of a covert squad slipping into Solamnia. Perhaps a Fist PC is hired by a wealthy merchant to exact vengeance upon a business competitor, only to find out that his target is the one truly wronged. Will the religious tenants that the Fist follows win out and cause him to hunt down the man who hired him, or is the temptation of money too great? On the island of Claren Elian resides a sizeable community of patriarchal warrior people called the Ran-Eli. Unlike most of Ansalon where monastic fighting styles take second place to the more popularized armed and armored warriors, on Claren Elian hand-to-hand combat is the only way of life. Young men who stand out as exceptionally gifted in their art are able to take a grueling series of tests. Those Ran-Eli who survive become a Master of Rank, the greatest honor in Claren Elian society. Masters of Rank are not only adept at using their own body in combat, but extend their training to make the most of wielding their weapons as if they were extensions of themselves. Class Requirements: In addition to the standard requirements, a master of rank must pass a test that includes non-lethal combat with a number of low-ranking masters, and one lethal combat with another master of rank. All of these battles are fought in single combat. Should any combatant utilize outside aid or attempt to use treachery, his death awaits him. A master of rank may choose any weapon of choice beyond the standard kama, siangham, nunchaku, or three-section staff. Time Periods: Unlike previous classes mentioned, there’s absolutely nothing limiting when a master of rank makes a viable prestige class. Throughout Krynn’s history members of the Ran-Eli (usually hopeful or accomplished Masters of Rank) have on occasion left their isolated island home to learn of the world around them. During the early Age of Mortals the Ran-Eli were the servants of Malystryx the Red, who saw their efficient fighting style as a means of garnering her own personal assassins. Once again the Ran-Eli are free of the Red Marauder. However, after being dispatched as assassins into the rest of Ansalon many Masters of Rank have brought back tales of the wonders that wait outside their island homes. Without the fetters of the overlord binding them, the people of Claren Elian are more curious than ever to journey forth and experience Ansalon for themselves. Masters of Rank in Adventures: A monk PC may meet a wandering Master of Rank, and be introduced to the weapon-oriented fighting style of the Ran-Eli. If the monk is interested in pursuing this fighting style, the Master of Rank will point him to the island of Claren Elian, where he may petition to take the Test of the Master of Rank. Female monks may have a particularly hard time of this, given the patriarchal society of the Ran-Eli. It will be a challenge in its own right to get the Superior Master to agree to hold the Test. Should the monk pass it, she’ll no doubt have to continue her struggle to earn the grudging respect of the other Masters of Rank. Regardless of how a PC gains the title of Master of Rank, an interesting dilemma awaits him: should he respect the Ran-Eli’s desire to keep the fighting style sacred and bound to Claren Elian’s Masters of Rank, or should the knowledge be spread to the other scattered monks on Ansalon? For more information on the Ran-Eli, check out Odyssey of Gilthanas. Have I murdered another of your pet kender?